Finally, comprehensive, easy to use go-at-your-own-pace DVD lessons for playing blues guitar that sounds great. You don’t need any experience and you don’t need to read a note of music. You’ll be playing blues guitar from the very first day. Have you always wanted to learn how to play the blues, but just haven’t had a good way to get started? Maybe you’ve just pulled the guitar out of the closet it’s been hiding in all these years, or maybe you just bought a new Strat yesterday. The point is all the same… you want to play the blues… not in 3 years… today! If you really want to learn to play, you need a series of lessons that take you step-by-step from point A to point B. Start simple, and grow from there. Imagine how great it would be if, after only a handful of easy lessons, you could actually play a blues song! Not some silly “Hot Cross Buns” or “Mary Had A Little Lamb (maybe the Buddy Guy version),” something you would be proud to show off to your family and friends. I don’t mean to brag, but for the majority of my teaching career I’ve not only had as many students as I could handle, I’ve often had a waiting list. And I’m sure there is only one reason for that… results. I’ve learned how to get people from where they are to where they want to go. I’ve done that through years of working with people and making systems out of what worked. Now you can have access to the very same system that only a handful of students have had access to in the past (and some of them drive 75 miles or more each way to get it!) And the best part is, I personally guarantee your success… but more on that later. I realize that there are hundreds of fantastic blues guitarists out there, probably even more. And I also know that while a lot of them can play great, learning to play guitar from them is a lot like trying to decode ancient cave writings… it’s just too dang hard. I also realize that a lot of teachers out there really don’t play that well… or that often. When I was growing up I was lucky enough to have teachers that not only taught, but were out there playing concerts and making records. Having that kind of experience on your side is invaluable. Listen, I love to teach, and I love to play. I’m fortunate in that I get to do both things a lot. I get just as much thrill out of playing for 10,000 people at an outdoor concert as I do watching one of my students look at me and say “that is so cool!” when something really clicks. Well, how much time have you spent poking around the internet looking for decent lessons? What if you had spent those hours practicing something that you knew would work? Do you think you’d be a lot better right now? You bet! The solution is Beginning Blues Guitar. When I heard that Griff had put together a beginner’s course, I jumped at the chance to get it. I was not disappointed. For true beginners, the early lessons will take you through your first chords and simple but cool leads, so that by lesson 7 and 8, you are playing a 12 bar blues song! By the end of the second DVD you’ll be playing a basic version of Buddy Guy’s (and Stevie Ray Vaughn’s) Mary Had a Little Lamb. I have to also tell you about the online forum that Griff built. It’s a place where his students get together to share tips and encouragement. The students include people from beginners to professional musicians and It has become an indispensable tool for me. If you want to learn the blues, Beginning Blues Guitar is absolutely the way to go. I look forward to joining you on the forum! Click Here To Order Now! 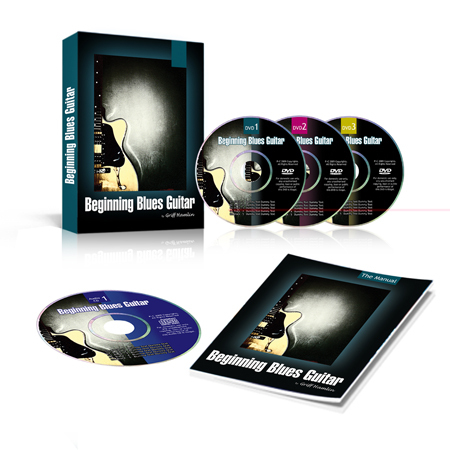 This multiple DVD set will take you from Absolute Beginner to Respectable Blues Guitar Player over the course of 29 easy-to-follow lessons. All about the parts on your guitar, electric or acoustic. You’ll know what it is and how to use it to make the best sound. The best way to hold and play the guitar so that it’s easy. This is one thing that no one seems to talk about, and doing it wrong can add weeks or months to the learning process. How to read TAB, the easiest form of music for guitar. TAB is a simple number system. If you can read numbers, you can read TAB. There is no guesswork and no crazy symbols to understand. This is how we can get you playing, not practicing, right away. Dozens of classic and contemporary blues licks. These are the same sounds you hear in your favorite tunes by Clapton, BB King, and Muddy Waters. They are broken down into small pieces that you can play quickly and easily. The Grand-daddy of all blues forms, the 12 bar blues. There are thousands of songs that use this pattern, and you’ll be able to play them all if you want. Strumming made easy. Everyone makes such a big deal out of counting rhythm and playing in time. In fact, you have a built in timing mechanism if you know how to use it. You’ll see how to take those rhythms and turn them into strum patterns in no time flat. The most popular strum in the world. I’ve taught thousands of songs to students and this one strum comes up more than any other. And it comes up in every style of music. How to hold your pick, and how to pick in both directions for maximum speed and consistency. This is one of the key ingredients to playing fast enough to keep up with the recordings you hear. The most popular “blues jam” riffs. Ever want to get together with some buddies and just jam? When you get these riffs, you’ll fit right in and be jamming in no time. All the “traditional” chords. It wouldn’t be fair to teach you all the blues chords and leave out the “regular” ones. You’ll have every chord you need for nearly any style of music, from blues to country to rock and roll. The secret of moveable chord shapes. Would you like to know 72 chords in a matter of minutes? It’s totally possible if you know how it works. It’s simple and amazing. How to play barre chords without feeling like your hand is going to cramp. If you’re trying to grip the guitar like a gorilla, you’re doing it wrong. Barre chords don’t take any more strength than any other chord if you know the tricks. Just thought I’d drop a note to rave about your Beginner’s Blues course. I love Country music and know that the Blues are the base of Country, so I just had to have your course. I must be honest and tell you that I’ve purchased instrument “how-to’s” before (I’ve probably got about $600 worth of other people’s products sitting in an office box, collecting dust). Needless to say, I was skeptical the FIRST time I ordered a different course from you and was blown away with the “down home, at your own pace, you are my equal”, professional attitude. Your course has enormous amounts of information that even we beginners can understand and there is absolutely no pressure to go at someone else’s pace. I recommend you on my Myspace page and to anyone I meet who’s interested in guitars. I wish you and yours continued success for years to come. This is a play-along example from one of the tunes…. Another play along example from another tune…. And one more from one of the tunes about midway through…. Now, the DVDs are great, and obviously that’s where the bulk of this great information comes from. But the real “secret” to learning to play well is playing along with the included CD. Every example that you’ll learn on the DVDs and in the printed manual is performed on the CD, often in 2 levels of difficulty. There are actually 17 different songs you will learn by the end. Playing along with that CD will be the absolute best thing you can do for your playing. To me it’s like learning to drive… When you play guitar, isn’t it better if somebody who knows what they’re talking about teaches you to do it right the first time? I think the answer is obvious. 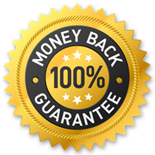 All I’m asking you to do is say “maybe.” Let me put it simply… I’m so confident in Beginning Blues Guitar that if you are not 100% completely satisfied with your investment today, I’ll give you a full 365 days to send it back for a full refund, no questions asked. I’m never satisfied unless you are more than satisfied. So here’s my simple “No Small Print” guarantee. Try Beginning Blues Guitar today and put it through the ringer. Use every strategy and technique as many times as you’d like for 12 full months. You be the judge. If this program doesn’t deliver everything I’ve promised, or if you’re unhappy with it for any reason, just return it and I’ll immediately refund every penny, no questions asked. I have no problem making this iron-clad guarantee because I’ve personally taught this method dozens of time so I know it works. Fair enough? I’m really excited about sharing this with you today. Really, you’re getting in on the ground floor of something truly exceptional. 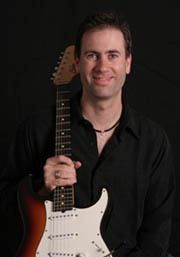 As you may know, my original Blues Guitar Unleashed course has been a great success, beyond my wildest expectations. So far over over 11,216 blues guitarists across the US, Canada, Europe, Australia, and even Africa have invested in this method. And I always felt bad because of all of the email I received asking for easier material. So I decided to create a course that contains everything a beginning blues guitarist would need, even if you have never even picked up a guitar before in your life. I got my copy of BBG. Thank you! My original reason for wanting a copy of the course was so that I could help new members on the Forum with their course material as needed. I didn’t think I needed it personally. As I progress through the course, I’m finding it helpful in correcting some bad habits I’ve acquired and an excellent review of things that I do know! I’m really enjoying the course. This course is an excellent precursor to your Blues Guitar Unleashed. I can’t thank you enough! This is a serious course on learning to play the guitar. It works, and I’ve proven it time and time again. And not only will you get everything you need for playing blues guitar, there’s quite a bit in there that applies to most other styles of music as well. If you were to come to me fresh off the street and start taking lessons, you’d be looking at somewhere in the neighborhood of 6 months of private lessons to get this material. At $50 per half hour, my current rate, It would cost somewhere in the neighborhood of $1200 in private lessons. But, of course, that doesn’t take into account driving to the lessons, arranging your schedule to make it every week, and keeping up with the practicing commitment. Shoot, at today’s prices the gas alone could easily cost you an extra $156 or more. So I want to make this a total “no-brainer” for you and offer it to you today for only $197 $167 $117. That’s 3 DVDs and 1 CD plus the printed materials… 6 months of private guitar lessons packed into Beginning Blues Guitar for just $117. And if you don’t feel you can swing the $117, I’ve even created a plan where you can split it up into 3 payments to make it more affordable. That means you can get started today for just $39… less than a dinner with the family! But I cannot guarantee that $117 price for much longer. My costs are on the rise just like everyone else, and if you come back tomorrow, the price may be higher. Just give Beginning Blues Guitar a try for 365 days. If it’s not everything I’ve promised it would be, just let me know and I insist on giving you a fast and easy refund. I absolutely stand behind all of my courses unconditionally because I know they are the best on the market today. A.YES! It is aimed at beginners. Many of my intermediate students have also benefitted from the course as they say it fills in holes in what they have learned so far. Q.Do I have to play electric guitar or does it work on acoustic? A.The notes don’t change… blues is blues. Everything I show in this course will work on an acoustic or electric guitar. If you are new to guitar I wholeheartedly recommend this course. In plain language it takes you through the basics and in no time at all you will be getting to grips with chord progressions and riffs. Most important of all – it really is fun!! PS. You are never too young too start. I am 63 and had a guitar laying around unused for years pending retirement. Now I am getting the benefit! Reason Number One: You can learn blues guitar at your own pace, in the comfort of your own home. No driving to lessons or wasting time and gas money. Reason Number Three: You have a full 365 days to “try” Beginning Blues Guitar. If at any time you are not completely satisfied, simply return the product for a full and prompt refund, no questions asked. Reason Number Four: With such a limited quantity, they won’t last long at this price. Get yours now or pay more later. Reason Number Five: There’s no time like the present. If you want to play blues guitar, you need some guidance to point you in the right direction. With Beginning Blues Guitar you get step-by-step, easy to follow directions. You simply cannot fail. Simply click the giant “Add To Cart” button below to get started learning blues guitar today. Your order is competely secure, and you have my personal 365 Day Satisfaction Guarantee. No guitar teacher anywhere can match that kind of promise. As soon as you receive the course, open it up, pop in DVD #1, grab your guitar, and let’s get started! Yes! – Please send me my copy of Beginning Blues Guitar for the special introductory price of just $197 $167 $117. I understand that if I am not completely satisfied within 365 days I can get a full refund with no questions asked. All orders are processed using SSL encryption processing so your order details are completely safe. Payment Gateway handled by Authorize.net, the leader in online transaction processing. P.S. – Many of the students who had a hand in the creation of Beginning Blues Guitar were exactly where you are today. The problems they faced and the information they needed is what drove me to put this all together in one package. You won’t find a more complete guide to learning blues guitar anywhere. P.P.S. – I personally guarantee your success, you have absolutely nothing to lose. You simply will not find a better way to learn to play blues guitar. P.P.S. – As with all things, prices are going up for me too. My $117 price is only guaranteed if you order today. But honestly, there’s no better way to get started on the right foot. Don’t make the mistake of learning things all wrong and having to go back and unlearn bad habits later. Griff, I am truly enjoying the Beginners lessons. For awhile I felt like I was beating my head against the wall, or else just “stoopid”. When I finally sat down long enough to go thru the first few lessons, it was like turning on the headlights on a dark country road. Things are finally falling into place for me, and I truly appreciate your efforts. I also strongly recommend this course to anyone who has the blues in their blood. it is GREAT!! !